The Agraria Candle Smells Amazing! Agraria is a high-end home fragrance brand that consists of 8 signature scents, each available in a variety of decorative gifts. Agraria’s signature fragrance, Bitter Orange, is the most desirable way to enhance your home during the winter months. A complex and subtle blend of Clove, the zest of Bitter Orange and a touch of Cypress, the Bitter Orange fragrance creates a warm and uplifting background for the holiday season. The Bitter Orange fragrance is available in the form of many decorative gifts for the home. The AirEssence Diffuser retails for $120, the PetiteEssense Diffuser retails for $50, and the Crystal Cane Candle retails for $35. 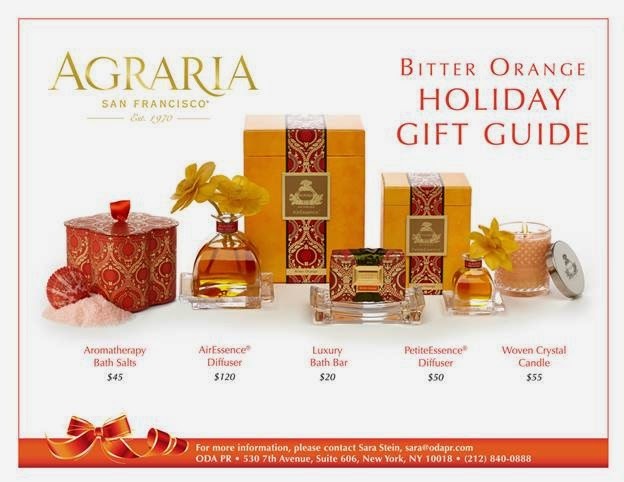 All of Agraria’s Bitter Orange products are available for purchase on www.AgrariaHome.com, as well as at Bergdorf Goodman, Saks Fifth Avenue, Neiman Marcus, and high-end gift shops. He got His just in time for the holiday and the apartment hasn't ever smelled so good. Great orange scent, and if He knows anything about women its that they love candles. Stock up on some of these for the holiday!